How a teacher is updated throughout his life? Which activities, materials, resources and physical or virtual relationships can provide a good learning opportunity for teachers? What are the contributions of ICT to the professional development of teachers? All these questions orbit around the concept of learning ecologies that could be defined as the set of context configurations composed of activities, materials, resources and relationships that are generated in physical or virtual spaces and that provide learning opportunities. Analyse and understand how the learning ecologies throughout life contributes to the professional development of teacher education. Identify the value that ICTs bring to this process. Suggest recommendations on how to extract greater benefit from learning ecologies. In parallel to the ECO4LEARN project, on last November 12, 2015, took place the international seminar organised by the Edul@b group “New contexts, multiple mechanisms: Learning Ecologies“. 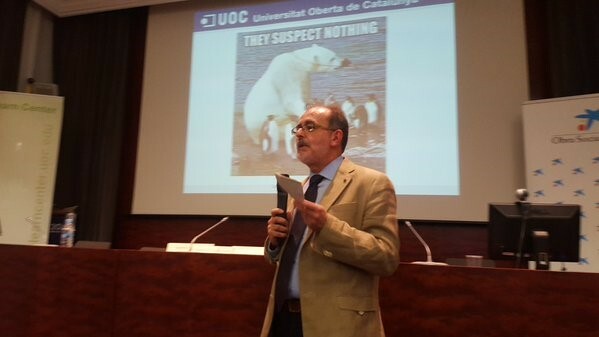 This event was attended by over 40 participants, among whom were professors from the UOC University and professionals from other Catalan and Spanish universities and institutions of the education sector.